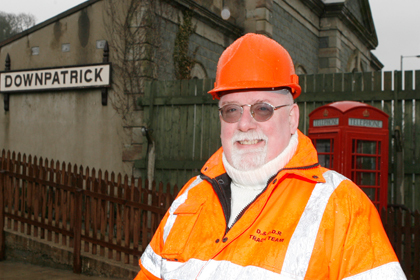 THE sudden death of Michael Collins, Chairman of the Downpatrick and County Down Railway, has shocked the district. Michael Collins was born in 1949 and came from a transport background. His grandfather joined Belfast Corporation as a tram conductor before World War I and retired as an inspector in 1947. In the same year his father joined the Northern Ireland Road Transport Board as a driver, became a conductor and later an inspector under the Ulster Transport Authority and Ulsterbus. The death of Michael Collins, a driving force behind the success of the Downpatrick and County Down Railway, and Board Chairman, has shocked the district. Robert said: “In 1967, whilst a student, Michael’s father arranged for him to join the newly formed Ulsterbus as a conductor attached to Smithfield depot in Belfast. Michael returned to this holiday job each summer until 1972. “He graduated from Queen’s University Belfast in that year with a BA in Geography and Political Science and a post-graduate Diploma in Business Administration, and later achieved an MBA. On graduation he was offered the post of Personal Assistant to Werner Heubeck, Ulsterbus’s charismatic Managing Director. Studies in Belfast, finally retiring as a Principal Lecturer at the Belfast Institute of Further and Higher Education. Robert added: “He was also the Company Secretary of Irish Transport Heritage, which is dedicated to bus preservation, and had recently become involved in the Charles Shiels Charity Houses in Killough. “On hearing of the sad news, the newly elected board, following last Saturday’s AGM, held a minute’s silence at the Wednesday night meeting, which Mike was hoping to chair, and then adjourned the meeting as a mark of respect.